Cleaning is not something I post about but I'm so happy with how clean my kitchen sink is I had to share it. We have this rather large kitchen sink that was white at some point in it's life but since we have moved in, it has not been so white. It had a lot of dark stains in it that no matter how hard I scrubbed they would not go away. 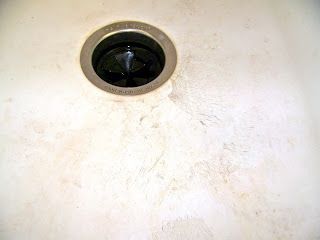 These aren't the greatest pics, but you can see the staining in the left sink and on the ridge. It isn't a porcelain sink but more of a plasticy sort of material. I had basically given up hope on getting it looking decent and it would drive me crazy because it always looked dirty. Then I got some spray bleach for general clean up and decided to give it a try in the sink. I sprayed it on the stains, let it sit for a bit and then cleaned the sink like I normally do. 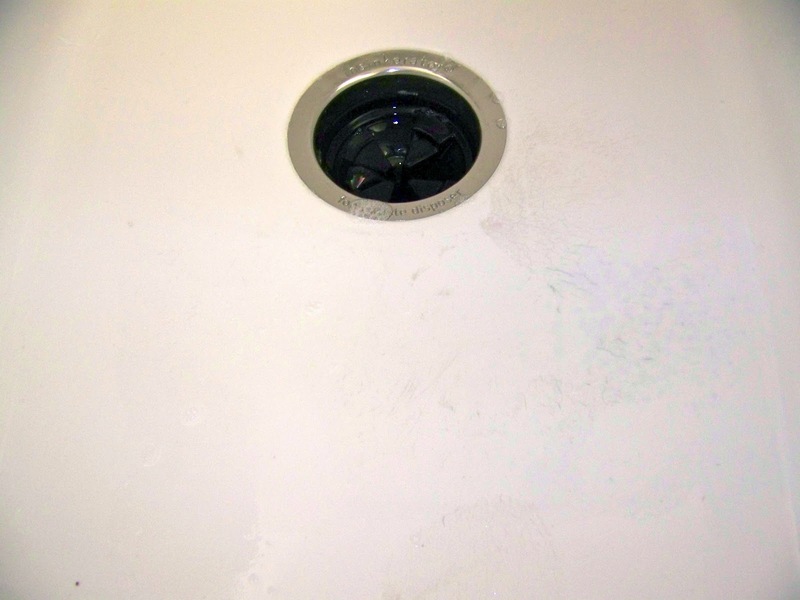 I was amazed to find the stains, while not completely gone, were significantly less noticeable. This sink has been cleaned with bleach.... yay! I was pretty shocked at how fast the stains went away and a little sad I didn't think of this earlier. 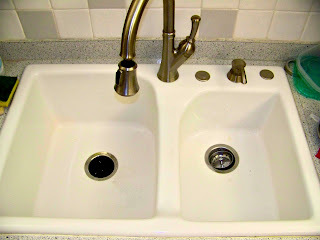 The sink is now white for the first time (that we've owned it)! I don't know what kind of material your sink is made out of, but I highly recommend Barkeeper's Friend for cleaning anything that can take a bit of abrasion. 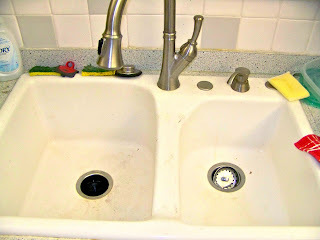 Stainless steel is an excellent case, but countertops and porcelain also clean up nicely. It's a weakly acidic solution that also has some small scratchy particles. Think of it like and exfoliation for your kitchen!